Despite a judge’s ruling to delay enforcement of key provisions in Arizona’s notorious anti-immigrant law hours before it was scheduled to take effect, protesters descended on Phoenix yesterday. Hundreds blocked a street near City Hall and were confronted by officers in riot gear, while others beat on the metal door of the county jail. More than 50 protesters were arrested by the end of the day. As if comparisons to the Civil Rights Movement weren’t already strong enough, such a statement practically summons the ghost of Alabama’s infamous law enforcer Bull Connor, whose aggressive tactics against peaceful demonstrators backfired when broadcast on national television. But rather than wonder if Arpaio is so blinded by power that he would make this same mistake, protesters should be asking themselves if they are up to the challenge of remaining nonviolent if he does? So far they have shown remarkable determination. Comparing the civil rights movement to opposition AZ law? Ludicrous. The nuts and bolts of the law (if you actually READ it) is making state law FEDERAL immigration law. 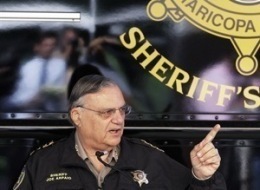 Comparing Sheriff Arpaio to Bull Conner? Ludicrous. The former outfits inmates in pink jumpsuits, the later used attack dogs on protesters. If only pink underwear was the worst of it, friend. There are other things that go on in Joe’s system that are inhumane.